We’re delighted to tell you that our next release, SEXSIM ED: ESSAYS ON GENDER AND LABOR IN ACADEMIA (Snowraven Books), by Kelly J. Baker, is up for pre-order! The academy claims to be a meritocracy, in which the best and brightest graduate students gain employment as professors. When Kelly J. Baker earned her doctorate in religion, she assumed that merit mattered more than gender. She was wrong. 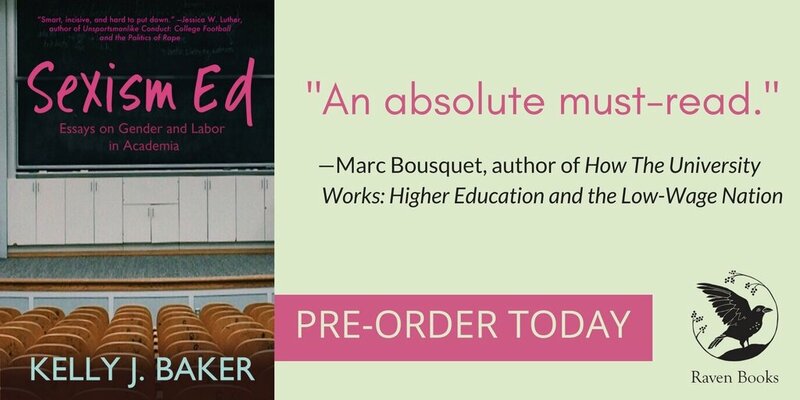 This book is her effort to document how very common sexism, paired with labor exploitation, is in higher ed. Pulling very few punches, Baker writes about gender inequity, precarious labor, misogyny, and structural oppression. Sexism and patriarchy define our work and our lives, within and outside of academia. It’s exhausting to be a woman, but Baker never gives up hope that we can change higher ed—and the world—if only we continue to try. Buy it on Amazon: bit.ly/sexism-ed. Buy it on Barnes and Noble: bit.ly/sexismed-bn.